Join Freedom House and MassArt's sparc! the ArtMobile for our postponed service project for Martin Luther King Jr. Day and connect with students and people in the Boston community to discuss the importance of Dr. King's legacy. 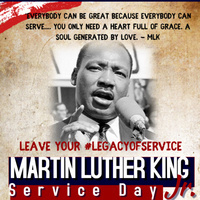 This day of service will be a time to reflect and engage with and in our Boston community. Participants will envision their ideal community through an interactive game and help to create murals to be displayed within the City's neighborhoods. Food will be provided, as will Freedom House swag. Additional sponsors include: the Massachusetts Promise Fellowship, and the Center of Community Service at Northeastern University.